London’s crazy housing market makes it increasingly difficult for “normal” people – those with a job and a half decent wage, who are considered too well off for housing association homes – to find somewhere affordable to live. They end up sharing with mates…….for years. Or live far out from London, with an exhausting train commute to lengthen their long working days. So here’s an alternative that is working to bridge the gap. Pocket Housing is the company starting a quiet revolution. Pocket, founded by Marc Vlessing and Paul Harbard, has developed a new model for delivering housing for urban professionals, people who will never get on a local authority housing list, and will struggle to afford an open market mortgage on their salary. They don’t do a preferred job in the fire service or NHS, so don’t qualify for typical shared ownership schemes, either. And culturally, they would prefer to buy. There are thousands of these people working in London, who at the beginning of the last boom would have just about afforded to get on the housing ladder. Today, they are confined to renting a shared home, commuting from miles away, or living in the parental home they had long hoped to leave. The unlikely vanguard for this coming revolution is a subtle but smart block of apartments being finished in a side street in Westbourne Park. Here, the Pocket model of small, affordable apartments for sale to a restricted market of buyers has once again been proven – but this time around, it has attracted mainstream interest from Westminster’s planners, and from a major developer in the form of Land Securities. The breakthrough has taken place in two stages. First, Land Securities came to Pocket, realising that they had a problem. Quite simply, navigating Westminster City Council’s current affordable housing policy can be slow, cumbersome and leads to considerable expenditure on consultants and advisers. “Big developers tie themselves in knots,” says Vlessing. Westminster’s preferred option for on-site affordable housing often creates architectural complications. The second option, searching for a local site to fit the housing, takes time, trouble and expense; while the third option, paying an affordable housing contribution instead, means hiring expensive consultants to prove the first two options aren’t viable. Land Secs were prepared to take a punt, and fund the land for a Pocket scheme that could be declared affordable. To make the idea fly, Pocket opened discussions with Westminster, who have now accepted the principle of their apartments as affordable housing, and of the developer’s cash commitment as an affordable housing contribution. “It crystallised a subsidy, and that is now a credit that Land Secs can use,” says Vlessing. The Westbourne Park site cost around £2m, and was bought with residential permission. Pocket substantially increased the density, obtaining a new permission for 32 units. 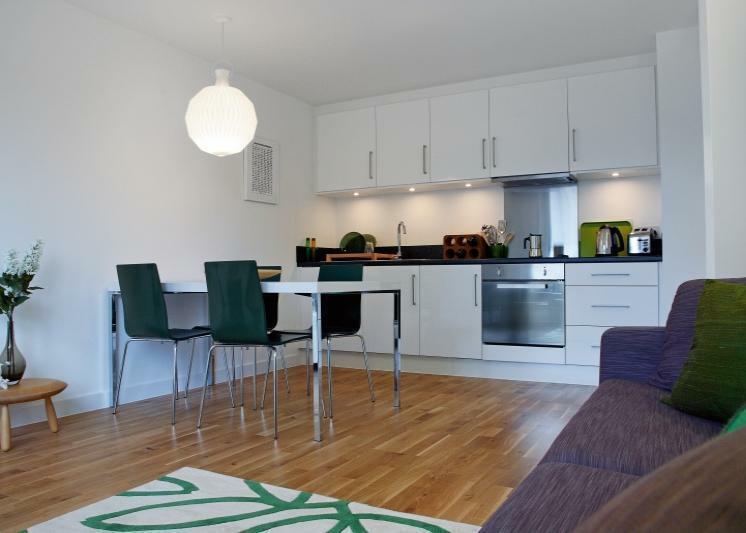 All are one bedroom flats, designed for singles or couples, and there is no on-site parking as the site is just minutes from an Underground station. 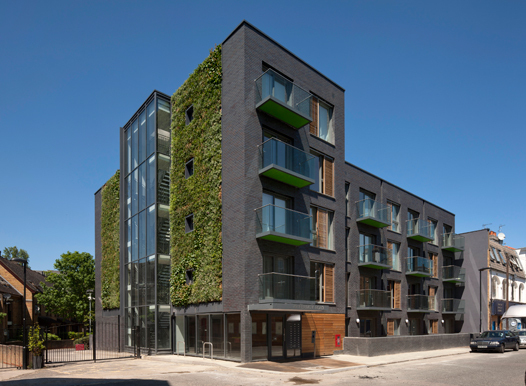 Unlike a typical private sector scheme, the Pocket project was designed to comfortably exceed current green building requirements: the building meets code 4, with ground source heat pumps, centralised underfloor heating, and a green wall on the block’s south face. This subsidised, restricted market sale model fits in a gap between open market housing, and a very limited supply of shared ownership homes. Most affordable housing contributions head via housing associations to deliver units that are rented to those on low or no incomes, with the government often paying some or all of the rents via the benefits system. Having taken the risk, Land Securities have now proved that there is a new, more efficient way to support affordable housing through the planning system – and opened up this new tier of housing for sale. And with the credit concept established, Pocket’s directors believe they have the key to getting traction. “It allows us to buy small infill sites when they become available, and we can bank those sites,” says Vlessing. “Everybody’s a winner,” adds Harbard. “We make it very clear what everything costs,” says Vlessing, and an open book approach helps all the parties understand the level of subsidy each project needs. With the apartments restricted in perpetuity so they can only be purchased by people below a maximum earnings threshold of £61,400pa, who have either lived or worked in the vicinity for the previous 12 months and are on a vetted register, “our homes remain affordable”. These restrictions are fully compliant with the affordable housing requirements laid out in PPS3. At Westbourne Park, the one bedroom flats have sold out at around £180,000 each, with many residents moving in before contractors have finished the common areas of the scheme. “There are no demand constraints,” says Vlessing – he could sell hundreds of the apartments this year, if they could be subsidised and built. Who buys a Pocket apartment?